Alaskan truck with new rebuild on upper. In this picture Jim and I hadn't been dating long. He told many tells about trucking. We made few trips in that old cabover up the Taylor Highway near Tok, Alaska. He was such a good teacher. The best thing he ever shared with me as the fact that he wanted me to go learn how to drive tractor trailer so we could run as team over the highway. Well, 2000 I graduated from Advanced Tractor Trailer driving school and we teamed many miles over the Alcan Highway. I seen bigfoot too, coming through British Columbia, Canada. I never told anyone cause they would have thought I was crazy. I never mentioned it. I also got to see a Spirit Bear on the Cassiar Highway. We also had accident on Cassier Highway. Jim always told me the safest place to sleep was to sleep behind the driver. I did but he still wrecked and I got dumped in corner with all the truck contents on top of me in corner. One cracked rip as I was treated as the only patient in the Stewert Hospital near Hyder Alaska . It was nice hospital and the stay here was another story. I agree with you jimmygee life is not the same these days. And yes the tool box isn't far away either. Im glad for the freedom to say and do what we want. The man in the cabover picture was my boyfriend Jim Bissell back in 1997 standing in front of our cabover up in Tok, Alaska. IT takes real man to DRIVE a CABOVER! So this guy is a TRUE DRIVER!!! 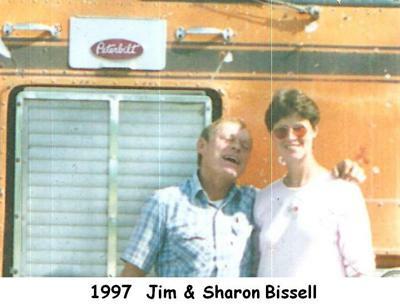 Looking back at my life and reflecting on the times now, life as a trucker is still the same in a lot of ways. More rules and regulations of course and different attire for the today trucker. So many wearing their per say "toolbox" on the faces one dont have to look far to find tools to work on truck with, just grab one from the face jewelery. Just couldnt resist that one. I was not trying to offend anyone but be truthful as to the times. Join in and write your own page! It's easy to do. How? Simply click here to return to Used Peterbuilt Trucks For Sale.